Suburbia 2.0: Embracing the Uburb. Data has a way of ruthlessly illuminating reality. Take the most recent Census Bureau numbers, which shed light on America’s internal migration patterns. Despite the never-ending and fervent parade of media stories about American metropolises swelling while their suburbs hollow out and become home to roving packs of feral pigs, the data indicates that suburbia, after momentarily falling behind urban America in growth, is once again expanding faster than our big cities. It seems that the current view of 21st century American settlement needs a bit of revision. Certainly, a number of our great cities have had something of a rebirth and gone more upmarket. But the post-Great Recession narrative of Millennials—in search of artisanal charcuterie restaurants, co-working spaces, and fixed-gear bike shops—leading the way for everyone into cities was never really spot on. Relatively few Millennials actually moved into urban America. And many of those that did move downtown are now moving to the burbs. All of that is to say that our nation continues to be primarily and stubbornly a suburban nation. Census Bureau data shows that starting in 1940, suburban growth began to outpace central city growth. By the year 2000, half of our nation’s residents lived in suburbia. Today, that figure stands at slightly more than half. The suburb, which seems as American as apple pie and teenage ennui, is by no means an exclusively American typology. The developing world is enthusiastically adopting a more suburban model, for better or worse. And there is evidence to suggest that the worldwide growth of metropolitan areas actually stems from the growth of their suburbs. The evidence also suggests that the biggest driver of suburban growth—both around the globe and in America—is financial: where wealth accumulates, such as in developing nations like China and India, sprawl inevitably follows. Thus, suburbia persists. Yet suburbs, in their current form, are problematic from the standpoint of resource consumption and carbon emissions. On average, American suburban households consume 25 percent more energy than their big city counterparts. And suburban emissions are responsible for 50 percent of America’s total carbon footprint. As global resources dwindle and CO2 levels rise, traditional suburban lifestyles will become more difficult to sustain and justify. Despite such difficulties, people will continue to move to suburbia, for myriad reasons. Thus, our most feasible solution is to rethink how we plan such communities to make them more efficient and sustainable. The suburb isn’t dead, but it craves the advantages of city living. That’s leading to an emerging residential market, the “uburb,” midway between the city and the suburb. Some large employers are collocating with them to tap their housing, amenities, and transit accessibility. Tysons Corner, Va., located just outside of Washington, DC, was recently cited by The Wall Street Journal as a prototypical example of a suburb pushing itself in a more urban—or uburban—direction. An outpost of outhouses and cows and as recently as the 1950s, Tysons Corner began its ascent when Tysons Corner Center, a hugely successful fully enclosed mall, opened in the late 1960s. Additional shopping centers and clusters of low- and mid-rise office buildings soon followed. But it wasn’t until the new millennium—after Tysons had established itself as one of the nation’s hottest and most traffic-choked office markets—that the suburb developed a plan to transform itself from a DC-area symbol of sprawl into a dense, transit-oriented collection of neighborhoods. The first of these new transit-oriented developments has already sprung up between Tysons Corner Center and one of the area’s relatively new Washington Metrorail stations. 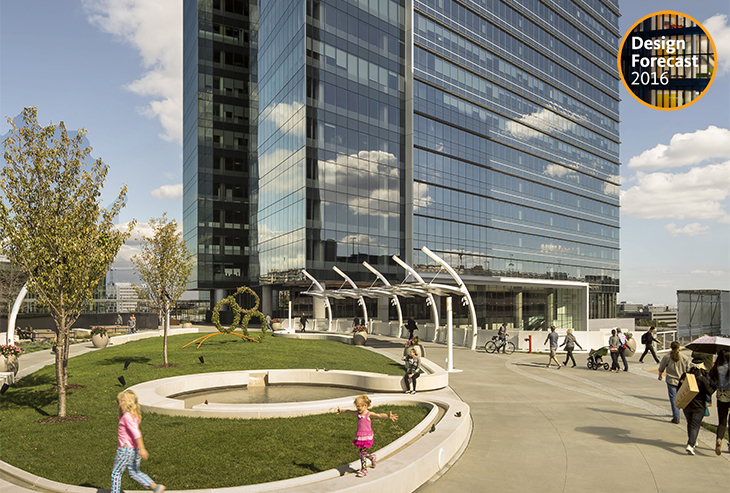 The mixed-use effort connects to the mall via a grassy plaza and features apartments, a hotel, and Tysons Tower, a twenty-two story office building which currently stands as the tallest structure in the area. As for whether the uburb becomes a more widespread template for suburb making (or remaking) remains to be seen. But plenty of eyes are on the Tysons version, including those of developers from China and Russia, which underscores the potential global impact of the uburb as a typology. It should be noted that a flexible approach to zoning is what makes the entire Tysons experiment possible. 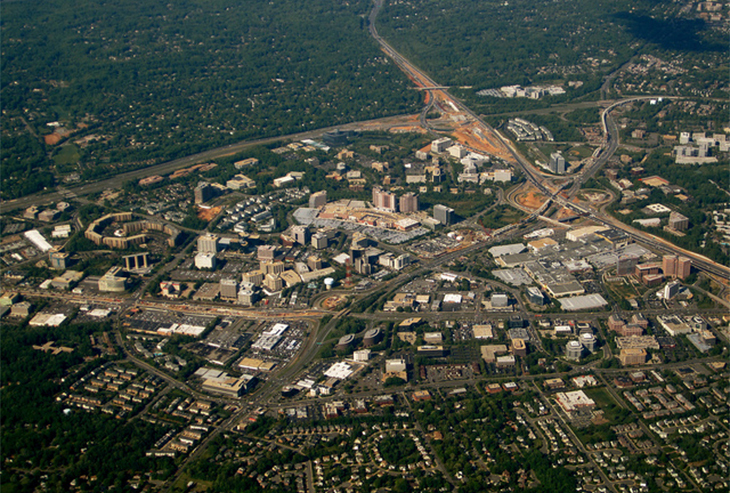 Rather than view its ordinances as sacred text carved into stone tables, Fairfax County, where Tysons is located, agreed to amend its zoning to allow for the kinds of development now taking place in the burgeoning uburb. In return, developers simply had to agree to concessions such as setting aside a certain percentage of units as below-market-rate housing, creating neighborhood parks, and building green roofs. But this kind of give and take between suburban municipalities and developers is the exception, not the rule. Too often, the antiquated suburban zoning ordinances that thwart any attempt at density, mix of uses, or buildings taller than four or five stories are staunchly defended by both residents and governing officials. Keep in mind that many of those ordinances were created out of fear: suburban municipalities worried that affordable multi-story, multi-family dwellings, for example, would attract “undesirable elements”—minorities and the poor. The American suburban model is, after all, primarily a product of tensions surrounding class, race, and ideology: Suburbia was once a realm restricted to the middle-class and upper-middle-class fleeing the economically disadvantaged populations that were a fact of city life. It was formerly the exclusive domain of whites retreating from increasingly black urban cores. And it was, once upon a time, the promised land for those escaping the grit and masses in our cities in search of something that leaned more toward the pastoral and ruggedly independent Jeffersonian ideal. When viewed through this lens, American suburbia was inevitable. Dressed up in a sheen of tranquility, security, and middle-class signifiers, the model was, and continues to be, imported around the globe. While the racial and economic makeup of American suburbia has evolved markedly in recent times, the old notions that sought to shut out certain groups stubbornly persist in parts of our country. An unintended side effect of those lingering notions and the ordinances that they spawned is that many suburban communities are now severely limited in their ability to respond to 21st-century resource and energy issues. Fear masquerading as safety and stability helped to create the suburb. But if we are to confront our ongoing environmental challenges, we must not let fear, in its many forms, prevent us from recreating the suburb. Brenden Jackson is a Marketing Writer in the Baltimore and Washington, DC, offices. With a background in creative writing, journalism, and marketing, he oversees storytelling for Gensler’s southeast region. Contact him at Brenden_Jackson@gensler.com.